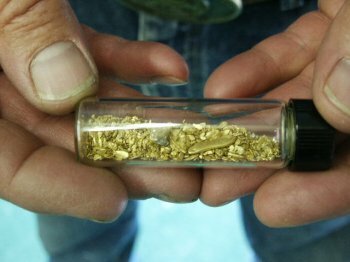 One of the best ways to get beyond your own uncertainty of what natural gold looks and feels like is to get your hands on some of the real thing! Glitter Test: Gold does not glitter. It shines. Sometimes it’s bright; sometimes it’s dull; but very seldom does it glitter. The thing about fool’s gold (pyrites or mica), is that because of its crystalline structure, it is usually glittery. Take the sample and turn it in your hand in the sunlight. If it is gold, the metal will continue to shine regularly as the specimen is turned. A piece of fool’s gold will glitter as the different sides of its crystal-like structure reflect light differently. Hardness Test: Gold is soft metal, even more than lead. It will dent or bend when a small amount of force or impact is applied to it. Pyrites, mica and shiny rocks are generally hard and brittle. Just a little amount of pounding will shatter them. Natural gold almost never shatters! Old-timers used to bite on a specimen to test if it was gold. This is another way of testing the larger-sized specimens. However, keep in mind that the larger-sized piece of gold is worth a great deal and the resulting tooth marks could lessen its value. 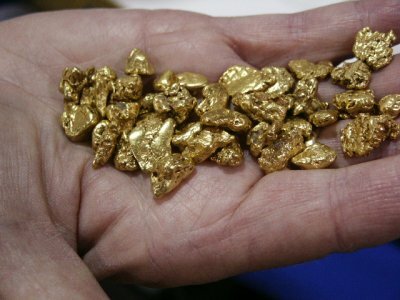 If you find a piece of gold big enough for you to bite on, you will have little doubt that it is the real thing, simply because of its nature and its weight. But if you are still uncertain of your find, you might try using the sharp edge of a knife and gently press in on the specimen in a place which is less likely to be noticed. If it’s gold, an indentation can easily be made into the metal with the blade of your knife. You will not dent the surface of a rock or iron pyrites. 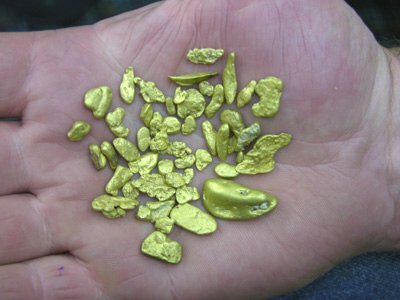 Acid Test: Nitric acid will not affect gold (other than to clean it), whereas it will dissolve most of the other metals found within a streambed. Nitric acid can be purchased from some drug stores or prescription counters. It can sometimes be found where gold mining equipment is sold. If you question whether your specimen is some kind of metal other than gold, immerse it in a solution of nitric acid. If your specimen is gold, it will remain rather unaffected. Almost any other kind of metal will dissolve in the acid. However, nitric acid will not affect iron pyrites or mica (fool’s gold), but those are brittle and will not pass the hardness test. CAUTION: Nitric acid can be dangerous to work with. Precautions must be taken to prevent harm to yourself and your equipment when working with it.